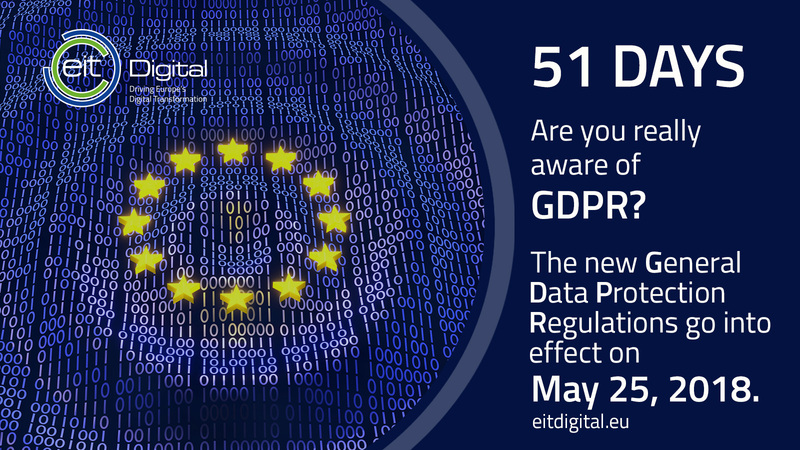 51 days to go before GDPR comes into effect (on May 25, 2018), Willem Jonker, CEO of EIT Digital explains what we all need to be aware of. Question: It seems that businesses (SMEs) are not well informed on privacy regulations. How can we raise awareness? WJ: The awareness of GDPR is too low because people think it only affects big data platforms. But it touches all companies using data. Governments need to explain the implications to businesses and citizens better. There are two views of GDPR: either you think that the new regulation will make business more difficult or that it will push us towards more innovation. Developing new services that are GDPR compliant is a more productive approach. GDPR and Net Neutrality are more closely connected than you might think: they both relate to the rights of the individual. Consumers need access to networks and they need their rights to be protected by regulators. Question: What is EIT Digital's role in this debate? WJ: Complex matters require informed decisions. EIT Digital is here to give analysis and perspectives. We have no position, but our responsibility is to analyse the deeper concerns and possible scenarios so that law makers can make informed decisions in the digital economy. Question: What are the European and American approaches to Net Neutrality? WJ: The USA and Europe have different views. Net Neutrality has come to an end in the US but is still protected in the EU. If you look at the individual as a citizen, then everybody has the same rights. If you look at the individual as a consumer, then the infrastructure is a marketplace and a way of providing services at different costs. So far, the tech industry has taken the marketplace view. Question: Will a unilateral decision from the US have effects in Europe? WJ: In the digital world, things are not separated from continent to continent. In the long run, the ways we look at Net Neutrality will have to converge. There may be differences and attempts at regulations, but you need a global and standard approach on Net Neutrality, especially between regions where a lot of trade is already taking place. Question: What is the European view? WJ: Markets in the US and Europe are comparable. A compromise will be needed between the two views. With 500 million consumers, Europe is in a strong position to make sure European values are represented in the digital world.